Alot has happened since I last posted. Renee and I have just upgraded our camping equipment to the next level. 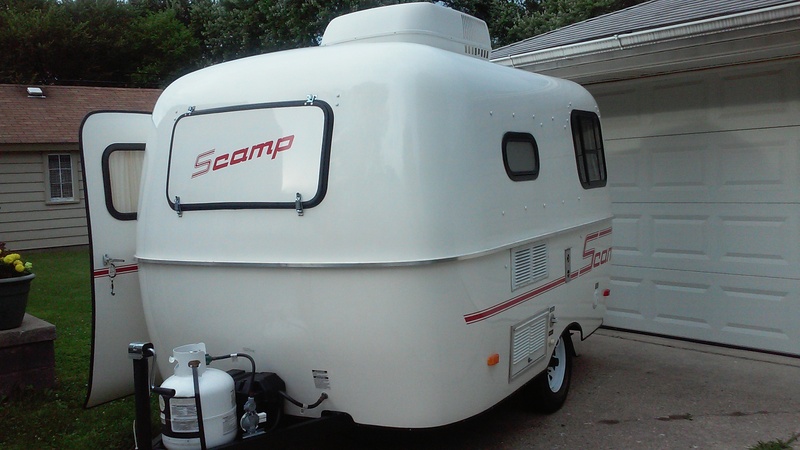 After much research and lots and lots of luck, I managed to nab a great deal on a used, (new to us) 2011 scamp 13 trailer. Trailer is in fantastic ‘like new’ condition and we’re very excited to really get some use out of it. I drove out to Michigan to pick it up and bring it back to NJ, towed great behind my Nissan Frontier. 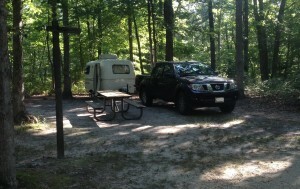 We couldn’t wait to try it and had our maiden stay at Turkey Swamp park for an overnight. Was a luxury stay compared to the cargo trailer I had recently rigged up with ac. We are extremely happy with it and are now planning more extensive trips. The trailer is equipped with Air conditioning, furnace, stove top, cold water sink w/12 gallon fresh water tank and city water hookup, 1.9 cu refrigerator, couch/bunks up front with dinette/ bed in the back. Lots more storage then we are used to along with a screen door and windows. I won’t go into too much detail about this little trailer, but having the continued convenience of having a small trailer to get in and out of just about anywhere is great! 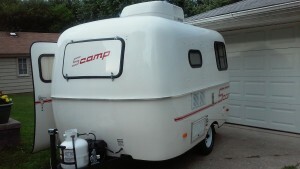 Size was a major factor for me when looking for a travel trailer. This one is 13 feet long (compared to my 11 or so foot long 5×8 trailer) and just short of 7 feet wide (exterior), it’s the perfect size for us! 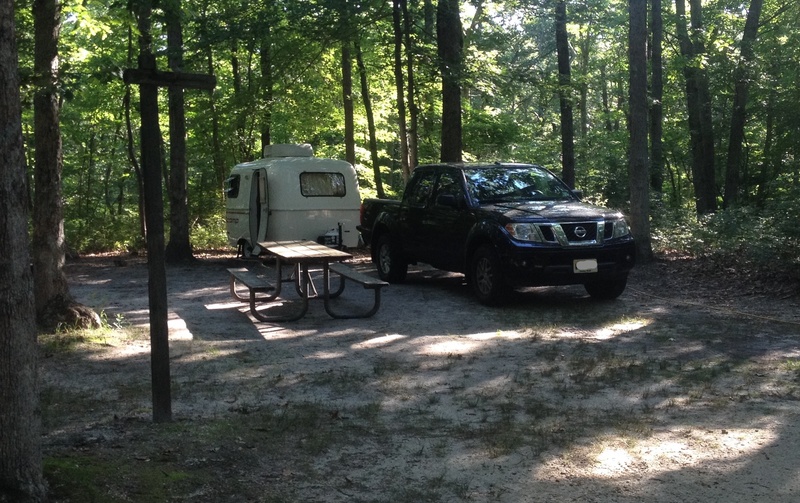 We really enjoy going out to Turkey Swamp Park, NJ due to it being a great campground and only 20 mins away from us. It is a bit on the pricey side but it’s nice for a last minute need to get away spot. We have a german shepherd with us all the time, so all parks we go to HAVE to be german shepherd friendly at minimum. Sites here are decently spaced and all sites are electric/water/pull through, fire ring, picnic table sites. I’ve seen some bus rv’s in sites throughout the campground (although maybe a bit snug to fit in). Dump station also available for the campers here. Clean Shower/bathrooms and a playground for the kiddies. Nice trails, boat rentals at a lake in the park and just overall beautiful wooded area. Staff are always friendly to us. If you are in the Monmouth county, NJ area I highly recommend it. And since we’re now planning to extend our camping adventures out of state, I setup a new map on the pages listed on the site above and will begin to actually blog about the places we visit and review them. 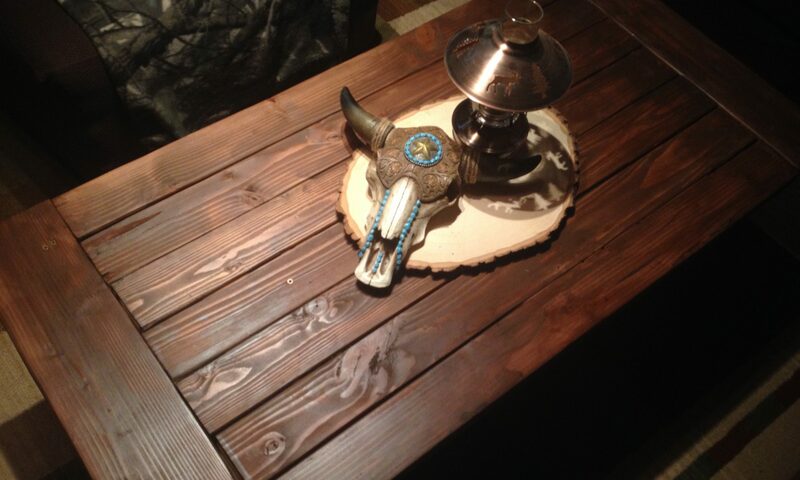 Shop using the link below to help support Pete’s Blog website, thank you!